Itll be a waste of money. Those machines are going to get jammed up by those showtime people that sell candy from that basketball program, much like how the swipers jam up the MetroCard machines to sell rides. Itll be a waste of money. Those machines are going to get jammed up by those showtime people that sell candy [WELCH'S FRUIT SNACKS] from that basketball program, much like how the swipers jam up the MetroCard machines to sell rides. Tonight, I was waiting for the in Manhattan, and these 3 guys wearing Fedex uniforms come into the station screaming and hollering. Then, one guy says to the others "hey, I'll show you how you can beat the turnstile!". He goes outside fare control area, goes to one of the HEETs, steps inside it, and repeatedly pushes the turnstile until it opened just wide enough to let him slip through (he was on the skinny side, but certainly not super thin). I've never seen that before. For any of you transit workers out there in the audience, how fast do the 4 and 5 go on Lexington Avenue? 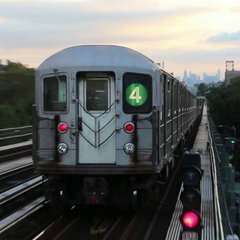 As a passenger on the early morning trains from Grand Central to 86th, i've noticed that the trains seems to be going pretty fast, but I never knew how fast. Terrible, absolute sh*t show. A ride from 42nd to Woodlawn can take up to 2 hours because people wont stop holding the dam door. Oh god, that long from midtown to the bronx? That's a tough job. Even as passengers we hate when people do that because it extends our travel time to. Just be glad you don't work on BDFM through 47-50th streets because that platform is packed to the brim during rush hour. I used to work by there and take the subway back and it was bad. Anyway, I always wondered why the train took so long to move off once the doors had closed, because i sit in the last car so I can get a seat. The middle cars are sardine cars so those people holding the door is probably the reason. You should see Union Square, 42nd and 125th...its like a nightmare. Plus most of the time we are so delayed we end up doing express runs in the bronx. I don't think any train can beat the . The AM rush is brutal on the Local and Express. You will have to let trains pass and wait for the next one just to get some standing room. 100% Relateable. I get on at hunterspoint and even though they come like every three minutes those things are packed AF! The R143s seem to be making their presence known on the again. While this isn’t new, I’m noting it as they haven’t been on the Jamaica line lately compared to some months ago when I would see up to four sets in one ride. 2 hours from grand central to Woodlawn? I doubt it ! The whole route from Brooklyn is only 1 hour and 10 min. Even though it’s rush hour 2 hours is way overdoing it! I always wondered...does anyone take LIRR from Woodside into Penn station to avoid the ? It would be quite expensive for such a short distance, but would probably save a lot of time. That seems like one stop that could be used to shift people from the subway to the LIRR's existing capacity if they made a special fare. Not even the train takes two hours to go from Flatbush to Wakefield... and that's the longest line in the IRT! a few trains arrived at Woodlawn 20 min late but even those the whole trip didn’t not take more then 2 hours so that’s it. @Abba How do I work Transsee.ca? Lol how about you ride the in the middle of rush hour and see for yourself. You'll get to experience what it feels like being in a sardine can along with the smell, and the constant passenger who keeps trying to force themselves aboard the train even though theres no room. Kingsbridge to Union Square takes 40-45 mins on average during the height of the AM rush hour (from around 7 to 8 AM). I do know that sometimes past 8:30 trains can end up taking 10-20 minutes between Grand Central and Union Square. I distinctly remember transferring to the from Grand Central one time and we passed 5 trains on the express track down to Union Square.